Domo Tactical Communications (DTC), a specialist in IP Mesh Networks and Video technology, has released an integrated 5 Watt IP wireless Mesh NETNode radio solution for the military and commercial market to meet the increasing demand for extended range communication. The NETNode Robust 5W offers secure and seamless exchange of video, audio and data in the most demanding of environments. DTC’s highly flexible IP Mesh technology means that data can be exchanged between wireless Nodes in point-to-point or, more commonly, point-to-multipoint configurations. A truly mobile system – one which will deliver in environments too tough for other radio solutions to cope with. Unlike traditional wireless options, the DTC IP Mesh continues to readjust itself as Nodes join and leave the mesh or move relative to one another. Through DTC’s proprietary variable flow rate algorithm and “Interlink” mode, one can use other IP bearers to form a flat but geographically wide area mesh network. This self-forming, self-healing mesh architecture makes the NETNode product ideal for use in surveillance, command and control applications or Robotic and Autonomous Systems (RAS). The NETNode Robust 5W is successfully deployed in fixed and rotary wing downlinks, ships, Rigid Hulled Inflatable Boats (RHIBs), Unmanned Surface Vessels (USVs) and fixed infrastructure installations. 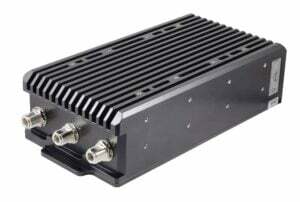 An inbuilt 5 Watt power amplifier supplies a network with extreme range capabilities that were previously unachievable. The NETNode Robust 5W offers DTCs signature COFDM waveform for excellent Non-Line of sight (NLOS) and multipath performance, plus enables Beyond Visual Line of sight (BVLOS) communications for RAS operations.